Robert Gangi minces no words when it comes to how the New York Police Department treats non-white and low-income New Yorkers. "By any measure the NYPD engages on a daily basis in aggressive, blatantly racially discriminatory practices," says the veteran advocate and organizer. 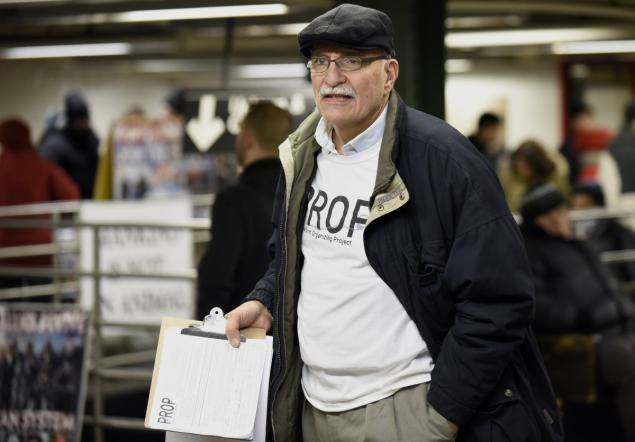 For nearly 35 years Gangi, 70, has fought for police and criminal justice reform, first as the executive director of the Correctional Association of New York, which he headed for 29 years, and, since 2011, as the head of the Police Reform Organizing Project (PROP), which he founded at the Urban Justice Center. His former organization focuses on statewide criminal justice issues, including reform of New York State prisons. PROP, according to its mission statement, works to expose "discriminatory and abusive practices of the NYPD, that routinely and disproportionately affect our city's low-income communities and people of color." Foremost among those practices is the NYPD's "Broken Windows" policy. The theory behind Broken Windows is that having police officers make arrests for minor violations such as vandalism, subway fare evading, and public drinking helps prevent more serious crime. Mayor Bill de Blasio and his police commissioner William Bratton insist that the policy, which Bratton first implemented in 1993 under Mayor Rudy Giuliani, is effective. 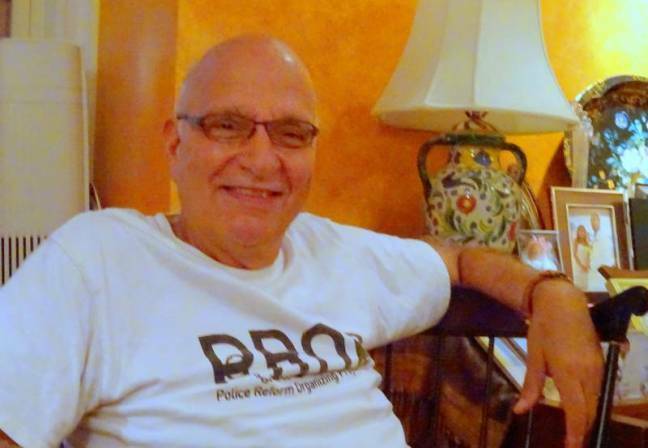 Bob Gangi and many other critics, however, insist that it victimizes low-income people of color and is counterproductive because it engenders mistrust and even loathing towards cops and the criminal justice system. One of the most controversial aspects of the policy has been "stop and frisk," the practice of police stopping and interrogating individuals on the suspicion they might be involved in criminal activity. Stop and frisk proved to be both racially discriminatory – the vast majority of New Yorkers affected were African American and Latino – and ineffective at controlling crime, since nearly 90 percent of those stopped and frisked were innocent. In 2013, a federal judge ruled that stop and frisk violated the constitutional rights of African Americans and Latinos. The Bloomberg administration, which staunchly backed the policy, appealed the judge's ruling, but the de Blasio administration dropped the city's appeal and agreed to implement the remedies the court ordered. Gangi, though welcoming the ruling, says it has done little to halt the NYPD's abusive practices. "Stop and frisk always was a symptom of Broken Windows," he says. "The NYPD could amend the use of stop and frisk but not change the basic approach to law enforcement. And that's what happened. The department has significantly scaled back the use of stop and frisk but continues to pursue very aggressively quota-driven, Broken Windows policing." Gangi insists on the term "quota-driven" because he says it is fundamental to the type of policing he criticizes. "Broken Windows targets low-income people of color who are engaging in innocuous infractions. Sometimes under the pressure of the quota, cops misrepresent the facts. They hand out bogus tickets, they make false arrests, or they ticket people who are riding their bike on the sidewalk, putting their feet up on the subway at 2:30 in the morning, walking between subway cars, begging. A fair number of people get arrested for unlawful solicitations, which means you ask someone to swipe you in the subway as they're getting off. Even if the person is willing to do so, you've committed a violation for which the police can and do arrest. Everyone we've seen arrested for this is a black or Latino person." Gangi recalls a conversation he had last year with a young, Latino police officer shortly after a cop in Staten Island killed Eric Garner, a black man, by putting him in a chokehold, resulting in his asphyxiation. The Latino cop said the police had handled the case badly, noting that Garner hadn't been doing anything dangerous, just selling loose cigarettes. He told Gangi that an unwritten but strictly enforced quota system pressures cops to make arrests for minor offenses like Garner's. "He said that the quotas are higher for certain communities than for others," Gangi says. "The west side of Manhattan would have low numbers, uptown and Harlem would have higher numbers. This officer used to work in Brooklyn; he said he would never arrest an Orthodox Jewish person there because they would make your life miserable. So much influence, so many connections. It was much easier to arrest black or brown kids." Gangi says that PROP's Court Monitoring Project, which observes proceedings in City courts, "enables us to state with complete confidence that these practices are marked by stark racial bias. Most of the charges are for innocuous infractions; rarely if ever do we see someone who's being brought through the misdemeanor arraignment court who could be called predatory or dangerous." He says that those arrested under the Broken Windows regime "fall into two categories: more or less regular working folks going through the ordinary business of their lives who are arrested for being in the park after dark, or walking between subway cars or driving without a license. The others whom we often see are significantly troubled or in trouble, homeless people, people with debilitating mental health issues, drug addicts, alcoholics. Policing in New York is not only blatantly discriminatory; it is counterproductive. It stokes the mistrust and antagonism people of color already feel toward the cops and the criminal justice system." Gangi sharply criticizes Mayor de Blasio and Commissioner Bratton for intransigently defending Broken Windows, despite de Blasio having run for office as an opponent of stop and frisk who would reform police practices. This month, the mayor agreed to a City Council proposal to hire nearly 1,300 additional police, after he – and Bratton – initially said they weren't necessary. "My best guess," Gangi says, "is that it was almost entirely a political decision, not one based on policy." "De Blasio had held the line on this since last year when [City Council Speaker] Melissa Mark Viverito brought it up," he notes. "It was a surprise when the new budget included hiring the 1,297 new cops." Gangi notes that the mayor "was taking a beating" in the media earlier this year "because there was a relatively modest uptick in shootings and murders as compared to last year. If the rate of shootings and murders continued at the same pace, they still would have come in at a much lower number and rate than most previous years. The Daily News and the New York Post were just pounding the issue. I think de Blasio got nervous and made a calculation that if he adds this many police officers, and Bratton is still highly revered by media, he can immunize himself from being attacked on the Right – 'look, I gave Bratton even more cops than he asked for.'" He doesn't buy the argument that hiring the additional cops will "enable them to redraw and reorient the department and create a new paradigm. It's just public relations because for all intents and purposes, they're not going to move away from broken windows policing." Gangi says that many New Yorkers believe Broken Windows works because of an "urban myth" that during the '90s, the policy broke the back of crime in the city. "There's no proof of that," Gangi says. "There's never been any academic study that proves that Broken Windows is effective in curtailing crime." He points to the three-week work slowdown in late December 2014 and January of this year by police officers as "the emperor's new clothes" moment for Broken Windows. During the slowdown, "arrests declined by extraordinary numbers, 66%, summonses by 90%, and overall crime declined according to the NYPD itself." "For three weeks, the NYPD effectively abandoned quotas and Broken Windows policing. They unwittingly showed us that we can have a safe city without these harsh, aggressive tactics." Gangi believes that although litigation can produce good results, it is no substitute for a militant mass movement. When asked whom PROP proposes to organize, he replied, "Everybody!" That includes "the most affected communities and also communities who for the most part are not affected on a day to day basis by these practices. But everybody in the city is affected because of the way they tear at the social fabric and because we're all responsible for the police department our tax money pays for. I think there's a potential for it, because the people of color for the first time feel hope that this issue can be challenged and they can win significant victories. I think there's also a growing awareness on the part of good white people of New York City that the NYPD is unaccountable and engages in discriminatory practices." He also says such a movement should focus not on "cosmetic" issues like body cameras for police, better training, or hiring more officers of color, which he says makes little or no difference. "If you want to have better relations with communities of color, you do two things: you stop the kind of policing you’ve been practicing, and you don't expect cops to be social workers. If you want more social workers, hire them. So our opposition, for want of a better term, is militant." Gangi, a Brooklyn native, says that his experiences growing up in the borough, among both liberal Jews and Italian Americans, influenced his political development and life's work. (Although he and his family lived in Flatbush, he spent much of his youth with his relatives in Bensonhurst.) His "solidly working class" and politically liberal Sicilian-American parents were "enormously goodhearted, warmhearted people." "They would welcome everybody who came to the house, there was just no question about that. Black people, Jewish people, everybody. I felt I picked up on that, the sense of valuing other people. I think the Catholic upbringing, too; you have to look out for your brothers and sisters. The Christ figure was someone who was generous to the downtrodden. And the '60s certainly was part of it; I became politicized then. I experienced what many young Americans experienced – shock at learning about the terrible practices of our government, both imperialistic international policies certainly dramatized by the war in Vietnam but also the racist policies that not only were concentrated in the South but were supported around the country, over the course of our history." He adds that his upbringing and ethnic culture also instilled in him a loathing of bullies. Broken Windows policing is, he argues, "a form of institutional bullying because virtually all the people brought into the courts have no political power and many are just vulnerable people, barely able if at all to lead anything approaching a stable life. These practices inflict more trauma and make their lives that much more difficult, while doing little or nothing to contribute to public safety."